First Came Fashion: Simple Twist. Melt butter in a small saucepan over medium heat. Add rosemary. 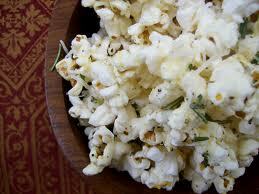 Drizzle butter mixture over hot popcorn in a large bowl. Season with salt and pepper to taste. Toss to coat. A simple twist on a classic snack. Enjoy.